Have you ever a ship bound for New York in the State of Amerikee. Oh, yes, my pretty Irish boy, I have a ship or two. At present she is taking in one thousand bags of meal. Straightway then I started, 'twas on the yellow-grog road. It's often times that I sat down and wished myself at home. To-day I'll serve you pork and beans, to-morrow yellow meal. Bad luck to the "Josh. 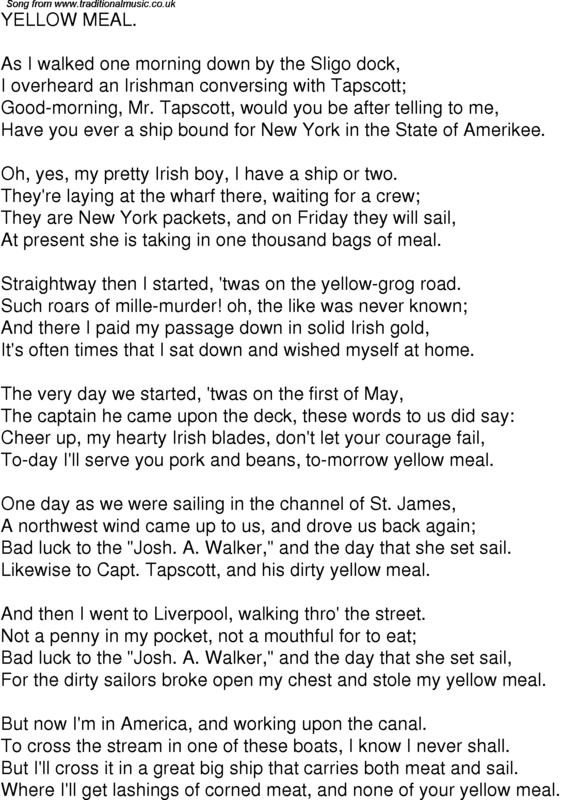 A. Walker," and the day that she set sail. Likewise to Capt. Tapscott, and his dirty yellow meal. And then I went to Liverpool, walking thro' the street. For the dirty sailors broke open my chest and stole my yellow meal. But now I'm in America, and working upon the canal. To cross the stream in one of these boats, I know I never shall. But I'll cross it in a great big ship that carries both meat and sail. Where I'll get lashings of corned meat, and none of your yellow meal.